Will Ohio State face Stanford 2014 Rose Bowl? With just three weeks remaining in the regular season the race for the Rose Bowl is taking form. This year’s Rose Bowl will be held January 1st in Pasadena. Here’s a look at the current race in the Big Ten and Pac 12. Big Ten: Ohio State is undefeated, winners of 21 straight, and has a clear path to take home first place in the Big Ten Leaders division. Due to their victory over second place Wisconsin the Buckeyes would have to lose two of their remaining games to not make the Big Ten title game. In the Legends division, the race is still wide open, with Michigan State the one team that controls their own destiny. Michigan State is undefeated in the division but has three relatively tough games remaining. The Spartans travel to Northwestern and Nebraska followed by a home matchup with Minnesota. If they win out, they’re in. If they lose one or two games the Spartans open the path for Nebraska or Minnesota to take the Legends Division. The Minnesota Gophers are the surprise Big Ten team, winners of four straight conference games. The Gophers have already defeated Nebraska and finish up the regular season at Michigan State. If the Spartans lose at Northwestern or Nebraska and Minnesota wins out the Gophers would advance to the Big Ten title game. Nebraska, who won at Michigan this past weekend, hosts Michigan State in Lincoln on Saturday. If the Huskers defeat the Spartans and win their remaining games they’ll take the Legends Division. Ohio State will be heavily favoured in the Big Ten title game, no matter who represents the Legends Division. If Alabama Crimson Tide and Florida State win out the Rose Bowl will likely feature an undefeated Ohio State versus either Stanford or the Pac 12 South representative. Pac 12: With Stanford’s victory over Oregon on Thursday the Cardinal control their own destiny in the Pac 12 North race. The Cardinal have a tough game with USC this coming weekend but wrap up conference play with a bad California team. They would need to lose both their remaining conference games for Oregon to overcome them, an extremely unlikely scenario. The race in the Pac 12 South is still very much wide open. First place Arizona State will take home the division if they win their remaining games including a key matchup with UCLA. The same goes for UCLA who will once again represent the Pac 12 South in a big rematch versus Stanford if they win out. Third place USC is on a hot streak lately but would need to defeat a good Stanford team this weekend as well as knock off UCLA in the battle of Los Angeles to end the season. Due to USC’s loss at Arizona State, the Trojans would still need major help to beat the Sun Devils. Arizona State’s late comeback versus Utah this weekend may have any realistic shot of USC winning the division. If the Trojans can defeat Stanford and win out there is still an outside shot though. ASU still has games remaining versus UCLA and their annual rivalry game with Arizona. Rose Bowl Projection: It’s tough to see anyone beating Ohio State in the Big Ten title game. The same goes for Stanford in the Pac 12. Look for Stanford to knock off UCLA in the Pac 12 Title game, setting up a very attractive Rose Bowl matchup between the third and fourth ranked teams in the country, Ohio State and Stanford. With Oregon’s loss at Stanford this past Thursday the road to Pasadena and the College Football National Championship Game is clear for the Alabama Crimson Tide and the Florida State Seminoles. Both Alabama and Florida State took care of business this weekend. The Crimson Tide put together a powerful second half to defeat the 13th ranked LSU Tigers going away. Florida State, coming off of last week’s destruction of the Miami Hurricanes, dispatched Wake Forest in blowout fashion. Both clubs have a couple potential road blocks in the remaining schedule but look destined to face off at the Rose Bowl in Pasadena on January 6th. Here’s a look at the top five teams in the BCS standings and their BCS point total. 1. Alabama (.996): Les Miles and the LSU Tigers gave the Alabama Crimson Tide a game for two and a half quarters before the superior Alabama attack took over and wore out the LSU defense. The Crimson Tide defeated LSU going away behind a strong performance from sophomore running back TJ Yeldon and the typical efficient passing game from AJ McCarron. 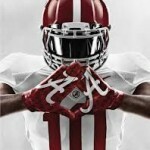 The Tide is now 9-0 on the season and look to be on a collision course with their fourth BCS title game in five seasons. Alabama has three games remaining, a road matchup with Mississippi State followed by a non-conference game with Tennessee-Chattanooga, two games in which they’ll be heavily favored in. Alabama wraps up the season with their annual Iron Bowl with a rejuvenated Auburn team. The Tigers are thriving under first year head coach Gus Malzahn and are ranked 7th in the country. They’ll have home field advantage with the game at Jordan-Hare Stadium. 2. Florida State (.962): The Seminoles have the quality of victory and strength of schedule to reach the BCS title game even if Ohio State and Baylor finish undefeated. Beyond an ACC Championship game where the Seminoles will be heavily favored the Seminoles only “tough” remaining game is a season ending rivalry game with the Florida Gators. The Gators are 4-5 on the season and have their poorest offense in years. It’s hard to see the Gators mustering enough offense to overcome the Seminoles dominant scoring attack led by Jameis Winston. Look for the Seminoles to go undefeated. 3. Ohio State (.893):The Buckeyes, winners of 21 straight games, just don’t have the quality of opposition to reach the title game provided Alabama and Florida State finish undefeated. Currently only one team on the Ohio State schedule, Wisconsin, is ranked in the top 25. The Buckeyes are the victim of a Big Ten conference that is increasingly falling down the list of the best conferences in college football. If Florida State or Alabama lose things could get interesting, with Ohio State competing with Baylor, or perhaps a one loss team for the title game. 4. Stanford (.869): The one loss Cardinal has to be kicking themselves for losing a shocker at Utah earlier this season. With a victory over Oregon the Cardinal has the strength of schedule and impressive victories to reach the title game if not for their inexplicable loss versus the Utes. Should Florida State or even Alabama suffer a loss the Cardinal are a potential one loss representative in the title game. Their quality of opponent will only get better as they wrap up their regular season in the strong Pac 12. 5. Baylor (.862): The Baylor Bears are quickly becoming the Oregon of the Big 12 conference with their high-powered offense. With a back-loaded schedule the Bears strength of schedule will increase as the year winds down. Should they stay undefeated they’ll still need quite a bit of help to make the title game. A loss by two of the three undefeated teams would likely be necessary to help Baylor reach the title game. Every year I hear B1G, formerly the Big 10 Conference, fans rant and rave about how they are just as good as the SEC. This comes on the heels of getting demolished in the previous bowl season. In 2013 it was more of the same. Some of my close friends that live in B1G Conference territory were talking up the conference from top to bottom. After seven weeks we can all laugh at them. The conference is just as bad as it has ever been. There is no way they can compete with the SEC. In fact, the B1G might be considered the fifth best conference in college football in 2013. It is a tough pill for many to swallow, but it is the truth. Sometimes it hurts to hear our favorite teams or conference is subpar but we need to accept it. Here are a few reasons the B1G Conference will continue to struggle in the years to come. I entered college in 2000 and that was the changing of the tides when it came to recruiting. I can clearly remember sitting in my dorm room and having a debate with my roommate that teams north of Tennessee and North Carolina simply could not compete in terms of recruiting. Why would a high school senior want to go play in State College, Pennsylvania over Miami, Florida? He could enjoy the nice warm beaches and beautiful women in Miami or he could suffer through the cold winters in Pennsylvania. Years ago, when travel was much more difficult, these northern schools could recruit because coaches would convince players to stay home. There is no more staying at home. Home is the entire United States. A college football player can hop on a plane and travel the entire country in less than a full day. In fact, if he is a very good college football player that has the ability to go pro he may be able to get from one end of the country to the other in just a few hours because of personalized aircraft. This was not the case in the 1980s and even early 1990s. It is also true that recruiters used to encourage kids to stay home so their parents could watch them play. Today there are more games than ever on TV. If mom and dad cannot travel to the away games they will be able to watch little Johnny on ESPNU, Fox Sports 1 or the SEC Network. If little Johnny is going to a team that will compete in a BCS conference there is a very good chance that 90% of his games will be on television. Now that mom and dad can watch the games on TV there is no reason to worry about travel. This makes me ask the question, why would any high school student want to play in a cold weather climate? I can understand the argument to play in cold weather if that is your brand of football. If you are the type of player that excels in cold weather climates it might be a good idea to play for Penn State or Notre Dame. Unfortunately for these schools, those types of players don’t really exist anymore as most high school football players want to run up and down the field and score 30 or 40 touchdowns a season. It is no longer the case that three yards and a cloud of dust is attractive like it was in the 1970s. Where Do High School Players Want to Go? As mentioned earlier, most high school kids want to go to the cool and exciting college campuses. When visiting South Bend, Indiana in late November there is going to be a chill in the air and most of the students will be bundled up. Take this same trip to Tuscaloosa, Tallahassee or Miami and you are going to see a much different campus. There will be many students wearing jeans but tshirts or short sleeve shirts will be common. It may even be the case that some of the girls are walking around in shorts or skirts. The only girls walking around in shorts or skirts in the northeast or midwest will be considered crazy. Trust me when I tell you that teenage boys are going to go where the girls are. I think we all have a story about one of our friends deciding to go to college because of that lucky lady. Most of the time that lucky lady never ended up with our friend but it did cause him to go to a specific school. With Facebook, Twitter and social media now being a huge part of the recruiting process high school athletes know where they want to go to enjoy the scenery. In fact, some universities have created groups of females to help show recruits around campus. This is just another attractive feature of a campus in the south. These female groups started in Texas and the SEC. It comes as no surprise as girls love their football in the south. If young men want to go where the girls are and enjoy the beautiful weather why would they decide to go to Michigan, Penn State or Notre Dame. In the past these three school dominated in terms of recruiting and having teams in the top 10. These are three of the most storied programs in all of college football with more wins than any other teams. Why can they not bring in the big named recruits anymore? It is all about location. If Notre Dame were located in Baton Rouge, Louisiana you can be rest assured they would have a top 5 team every year. 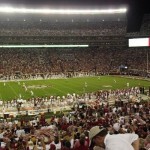 If Penn State were a university in south Georgia or Florida they would be in the BCS title game every other year. Unfortunately, there is nothing they can do about their location. This makes recruiting very difficult and it may cause programs to change their mind when it comes to the overall direction of the football team. A good example of this is Oregon. The Oregon Ducks realized that playing traditional smash mouth football was not going to work because of their location. They could not recruit stud offensive and defensive linemen every year so they needed an alternative. The alternative was a very unique offense that was built on speed rather than on power. Oregon was more than willing to take players that normally would not play at the big schools like USC, Texas or Oklahoma. They used these smaller, faster players to develop a brand new style of offense. Instead of trying to run the ball on first and second down they decided to spread it out. The Oregon offense throws to set up the run. They also have a spread offense that rarely uses two tight ends. Heck, most of the time the single tight end is lined up as a wide receiver. This new style of offense is very attractive to high school athletes that might be extremely fast but not that strong. When anyone watches an Oregon game during the fall months they can clearly see that most of the players are slim yet quick. This is something that Alabama, LSU and Florida would never had to do. These SEC schools can recruit five star offensive and defensive linemen every single year. This allows them to play a different brand of football. High school athletes will go to these schools just because of their location and history. Oregon recognized that location was not in their favor so they went a different direction. We are seeing something very similar going on in Columbus, Ohio right now. Urban Meyer has brought the read option to Ohio State and he is recruiting more speed players. This will allow him to get enough speed on the field to compete with the big boys from the SEC. Something interesting about Ohio State is they do have the history to get some great five star recruits. If you can combine five star recruits with a unique offense the sky is the limit. The only problem that Ohio State has right now is the location. Columbus, Ohio is not the most attractive area for high school athletes. When you think of vacation hotspots Columbus is not at the top of the list. Although this could cause problems in recruiting Urban Meyer knows how to get athletes for specific roles in his offense. Over the next two or three years it will be interesting to see if the location of Ohio State holds them back when it comes to a national championship run. 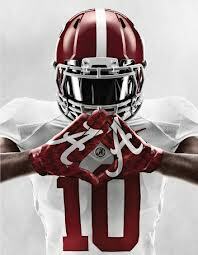 Something that will likely hold them back from a national championship run in 2013 will be their conference. The B1G has shown they are not ready to compete with the SEC and other power conferences. Until the B1G has several good teams (in the top 15) it will be the case that no one is willing to give Ohio State respect. They are not playing the toughest conference schedule so they may not be worthy of a spot in the BCS National Championship game. Are Sporting Events More Enjoyable Live? Throughout my younger years I did everything in my power to go to live events. Whether they were concerts, sporting events or even musicals. There is just something special about being at a live event. Unfortunately, some live events have gotten out of control and it is hard to enjoy oneself when there are 50,000 to 100,000 people that are out of control. I am not old by any means, but I am much older than I used to be. I know, that is rocket science! In my youthful days I was more than happy to get down in the mosh pit and crowd surf at a concert. I would stand in the student section of a college football game. I would even go to a major pep rally in which fans were not in the best of conditions. At the time, I enjoyed the experience. Now, I get frustrated as some people simply do not know how to act in public. When I was in elementary school I started to go to live sporting events in the form of high school volleyball and basketball games. I had an older sister that was very good in both sports so my mother would drive us to all of the games. I would try to pay attention for some of the game but I was an 8 year old boy looking to get into trouble. Even though I was not 100% into the games I still learned what it was to attend a live sporting event and be respectful of those around me. After growing up attending live sporting events it was something that was in my blood. During my middle school and high school years I was either playing sports or watching sports. During any given week I attended three to five live sporting events. On Tuesday and Thursday it was volleyball games. On Wednesday it was a cross country meet. On Friday it was football. There were even Saturdays that I would travel to a different town just to catch another sporting event like a golf tournament or a tennis match. Let’s just say that I had to be doing something at all times and many times this involved live sporting events. When I walked on the campus of North Carolina State University I immediately sought out the sports schedule to see what was going on. I joined the Student Wolfpack Club so I could accumulate points for going to live sporting events. I would watch volleyball, men’s and women’s soccer and any other event just to get away from the classroom. On Saturday I would spend the entire day tailgating and gearing up for the football game. There were very few Saturdays in which I was not at an NC State football game. No matter where we were playing I was at the game. I traveled as far as Columbus, Ohio and Tallahassee, Florida to watch the Wolfpack play when I was in my undergraduate years. Even as a busy college student I was still attending three to four sporting events a week. As I grew older I was unable to attend as many sporting events because life called. Sometimes the job gets in the way of attending those games. After moving to Chapel Hill about 16 months ago I decided that I would try to attend as many sporting events as possible. I make my own hours so I have the ability to go to events during the week and even during the day. This past fall I attended a volleyball, soccer and field hockey game all within 24 hours. College football and college basketball are gearing up as well. During the spring months I focus on lacrosse but I will also go to track meets and tennis matches. From a personal perspective, I truly enjoy going to sporting events where there are not a ton of people. During women’s lacrosse games, in the spring, there will be between 50 and 100 fans. This is Heave to me. When there are 50,000 fans things start to get out of control. Are Sporting Events Too Big? When the UNC basketball season starts there will be 20,000 fans ready to watch the Tar Heels take on the Kentucky Wildcats. With this many people excited about an event I try to stay away. I can watch this event on my HD TV and I do not have to deal with parking and getting in and out of the game. I also don’t feel like dealing with all the people around me that have no clue as to what is going on. The few times I have been to UNC basketball games I have sat in the student athlete section. I have some friends that are student athletes and they know what is going on when the basketball team is playing. If I were to sit in regular seats I probably would not be able to stay for the entire game. The same is true when it comes to college football. When I was at NC State I went to Columbus, Ohio to see the Wolfpack take on the Ohio State Buckeyes. The attendance for that game was in excess of 100,000. I sat in the middle of the Ohio State student section and it was difficult to swallow all the things that were being said in that section. I am a very open minded person but some of the college students were downright dirty. I can assure you that this does not change as you get outside the student section. I have been to several games in Neyland Stadium in Knoxville, Tennessee. I have heard similar or even worse commentary. When sports and alcohol are mixed some people just do not know how to act. I attended an Oregon vs Tennessee game in Knoxville a few years back and I promised myself I would never attend a game in that stadium again. Well, since then I have done all I can to avoid going back because of the experience. There are many people that only want to watch sports if they are at the event. I am the exact opposite. When I am at some of these sporting events I enjoy people watching but I am not as interested in the game. I tend to watch the jumbotron and I do not focus on the field. Part of this is because I love to analyze a game. If I am sitting in a seat at the game I am unable to see everything that is going on on the field. In my college days I would always get seats as close to the 50 yard line as possible so I could keep an eye on all the goings on. My friends were shocked at how much I noticed during these games. If a player was limping or not in for a play or two I would notice it immediately. One of the main reasons I do not enjoy major sporting events anymore is the home HD experience has improved so much. TV channels like ESPN, NBC Sports and CBS Sports offer close up video of all the events I enjoy. I have attended a few golf tournaments over the last few years but nothing compares to sitting back and watching the final round on CBS Sports on a Sunday afternoon. The announcers have their eyes on everything on the course and you do not miss a good shot. If you are attending a golf tournament it is highly likely that you will be following one group of golfers. I think every golf fan or golfer should attend a few golf events in their life just to see what it is like for the professionals to hit the ball. After you have been to a few events you will understand why watching on TV is so enjoyable. Something I would suggest all sports fans do is to go to a live event for their favorite team or player once. When I go to a golf tournament I love to walk the course on a Thursday or Friday so I can sit back and watch it on TV over the weekend. You have a much better understanding as to how hard the course is after having walked it the previous day. You will also get to experience seeing some of the things you would never notice on TV. In the golf world most people may not realize how much talking goes on while the players are on the course. This is especially true during the rounds early in the week. When attending a football game some people are shocked at how loud the stadium can get during certain times of the game. If a team needs a stop on 3rd down some of the NFL and college football stadiums can make your ears ring. Make sure to partake in some of these sporting events to truly enjoy watching on TV later in time. After four weeks of the college football season most fans feel as if an undefeated SEC team is a shoe in for the 2014 BCS National Championship game. This isn’t really up for debate as the SEC has won the last seven BCS titles. The bigger debate is who will play the SEC champion if several teams go undefeated. The major contenders right now include Oregon, Ohio State and Clemson. Clemson has a propensity to lose a game they should not so I will save that argument for last. The more interesting argument is Oregon vs Ohio State. If these two teams go undefeated who deserves to play an undefeated SEC champion in the title game this year? The Oregon Ducks have been a stellar program over the last five years. Even though they lost head coach Chip Kelly to the Philadelphia Eagles after last season the offense has not skipped a beat. Oregon has been known as having a new age offense that moves the ball up and down the field quickly. The “Quack Attack” has revolutionized the way some teams play college football. Instead of snapping the ball with less than 10 seconds on the play clock teams are trying to snap the ball as quickly as possible. The Oregon offense doesn’t even get into a huddle. This is much different from traditional football which is to huddle after every play and take time to work down the field. The traditional way to play college football usually keeps possessions at five to eight minutes. Oregon often scores in less than two minutes. Oregon has played in a national championship game in the last five years. There is little argument that Oregon was the most competitive team to play an SEC team in the national championship game. In fact, Oregon had a very good chance to win the 2010 National Championship. Other teams like Texas and Notre Dame were blown out in the national championship game by SEC teams. This matters to voters because they want to see the best possible game in the Rose Bowl on January 6th, 2014. Last year the college football world was burned when Notre Dame was dominated by the Alabama Crimson Tide in the national championship game. A team from the midwest did not match up well with the dominate SEC champion. This is one of the reasons some diehard fans feel as if Ohio State should not get a chance in the BCS title game. Oregon has a much faster paced offense and they have competed well against SEC and southern teams in recent years. Another argument for Oregon is the entertainment factor. 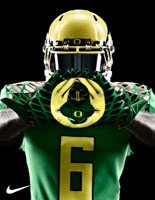 The Nike creator, Phil Knight, graduated from Oregon and he has a field day creating their uniforms. You never know what you are going to get when Oregon runs on the field. From personal experience, watching an Oregon game has a lot to do with the uniforms and the off the field antics from the Duck mascot. Entertainment is now a very important part of college football. After a 2013 BCS National Championship game that was not entertaining at all voters will want to put in a team that will keep eyeballs glued to the TV. The ratings for the championship game last year were terrible because Alabama had it wrapped up by the middle of the second half. Oregon may not be the second best team in the country by the end of the season but they might be the best choice to play Alabama, or any SEC champion, in the BCS national championship game for entertainment purposes alone. Even if Oregon goes does 14-0 or 21-0 you can almost guarantee they will continue tossing the ball all over the field as quickly as possible. If other teams get down by more than two touchdowns the game is all but over. Even though this did not matter in the past it does today. Advertisers want eyeballs on the game and one way to keep eyeballs on that particular channel is to put Oregon in the game knowing they will not slow down and never be out of it. Ohio State has been in a national championship in the last decade and they were blown out by an SEC school. In 2006 the Ohio State Buckeyes went into the BCS National Championship game undefeated and heavy favorites versus the University of Florida. Interestingly, the current Buckeye head coach, Urban Meyer, was the Florida head coach in that national championship game. Some people may remember the game because Ted Ginn, Jr. returned the opening kickoff for a touchdown but ended up hurting himself on the play. After that play the game was all but over because Florida dominated. There was nothing Ohio State could do to compete with the speed of Florida. When all was said and done Florida defeated Ohio State 41-14. The fact that the Florida speed dominated the Big 10 champions makes many people wonder if this will happen again. Well, that argument is not necessarily valid as Ohio State is now coached by Urban Meyer who runs the spread option. The spread option was perfected at Florida with Tim Tebow. Meyer ended up stepping down from the University of Florida for health reasons. He took over the Ohio State coaching position last year and led the Buckeyes to an undefeated season. This has changed everything in Columbus, Ohio. Meyer has proved to be one of the best coaches in college football when his heart is in it. At this point in his career it looks as if his heart is still in it at Ohio State. When Urban Meyer has his types of players on the field he can compete with anyone in the country. This is the main argument for Ohio State being in the championship game if they run the table. The other side of that argument is the depth of Ohio State. Every year there will be injuries. The fact that this is Urban Meyer’s second year means that many of the backups are not his recruits. One of the biggest issues with B1G football is the lack of speed. Urban Meyer recruits speed but he only has two recruiting classes at Ohio State for the 2013 season. If a key linebacker or defensive end goes down he may have to insert someone that was not necessarily his recruit. The lack of depth and speed is a cause for concern when it comes to the backups. If Ohio State can remain healthy they can compete with any team in the country. In the second week of the season we saw a major injury to the Ohio State Buckeyes roster. Braxton Miller, the starting quarterback, has been out the last two weeks due to an injury. If these injuries start to add up in Columbus I personally feel as if we would see a national championship game similar to 2006 if the Buckeyes play the SEC champion. Urban Meyer is definitely an SEC style coach but it takes several years to fill the roster with speed. Ohio State is still a year or two away from having the potential to go two deep with any team in the country. Their starters are very talented but it is the backups that I worry about. An interesting player in the 2014 BCS National Title race is the Clemson Tigers. Clemson has a huge advantage over Oregon and Ohio State because of their non conference schedule. If Clemson runs the table this year they will have beaten two of the top SEC teams – South Carolina and Georgia. If Clemson can go undefeated they have every right to be in the national championship game. They will have victories over South Carolina, UGA and Florida State this year. That is enough for me to say they are the second best team in the country behind any undefeated SEC team. No other team, outside of the SEC, will have beaten schools of this caliber. That said, Clemson is known for losing games they should never lose. In past years they would beat the great teams and turn around and lose to Virginia or Wake Forest. Some people feel as if Clemson is over that hump but I will believe it when I see it. I really do hope that Clemson runs the table because I live in the heart of ACC country. It would be nice to see the ACC well represented in the national championship game. It has been too long since the ACC has had an appearance in a big time game. When they have appeared in a BCS game they often lay an egg and make the conference look bad. Let’s see how Clemson plays the rest of the year and we may address this conversation again. At this point, I have to see Clemson win the games they should to put them in the national title talk.